Halloween is almost upon us once again and there can be few better ways to spend it than in the company of a band that the NME's Ben Hewitt described as "a group of p**sed-off 20-somethings living in Leeds, stuck in the soulless drudgery of a dead-end nine-to-five existence and loathing every second of it." Fresh from a triumphal summer of festival appearances, Leeds' own post-punk troublemakers Eagulls are back on the road. Their Halloween date at the city's legendary Brudenell Social Club venue will be the penultimate date of the UK leg of their tour, before they pop down the M6 for a show at Manchester's Soundcontrol on November 1st. Whether this tour finale will have a soul-cleansing All Saints Day theme is unconfirmed. What is for certain, however, is that Eagulls are eager for you to join them as they bring their Halloween show to the city of their inception. Doors are at 7:30pm and tickets cost £5. 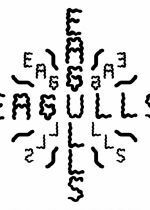 It's been a great year for Eagulls. Their debut album went down a storm on its release in March, comfortably justifying the hype built up from several years of gigging and dropping a clutch tantalisingly good 7"s and split-singles. They even managed to appear with Bill Murray stateside on David Letterman's show back in February. Halloween promises to be similarly impressive. Make sure you are in attendance.